Riding on a motorcycle can be lots of fun for adults of all ages. While motorcycles provide a great riding experience, they can be more dangerous than cars. 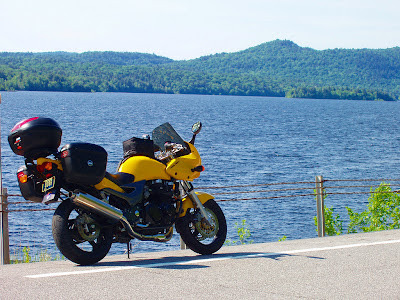 The following article provides effective tricks and tips on how to improve motorcycle safety. It's essential to make sure that one wears a motorcycle helmet at all times. While motorcycle helmets aren't required in all states, they can reduce the risk of serious head injury in the event of an accident. In addition to a motorcycle helmet, it's a good idea to make sure one wears long pants and a padded jacket. This will reduce the risk of road burns if one falls off his or her bike. In some cases, long pants can mean the difference between a pair of damaged pants and a skin graft. It's also important to make sure that one drives in a defensive way. While all vehicles should obey the rules of the road, it's essential for motorcycle drivers to be ready for anything. For example, if a car is following a motorcycle at a close distance, try to move to a different lane. If this isn't possible, pull over on the side of the road and allow the other car to pass. While this may be inconvenient, it can reduce the risk of a serious accident. In addition, it's essential to make sure that one is aware of the location of all vehicles on the road at all times. While people should use turn signals when changing lanes, many people forget to do this. Because of this, motorcycle drivers should pay attention to vehicles that are next to them on the highway. If possible, try to avoid driving in the blind spot of another vehicle. This can reduce the risk of a serious accident in the future. It's also a good idea to make sure that one burns the headlights on a motorcycle at all times. Since motorcycles are more difficult to see on the road than a traditional vehicle, it's essential to make sure one's motorcycle stands out from other cars. In many cases, it's a good idea to have a light that oscillates in brightness. This is a sponsored post by Robert Reeves, an experienced motorcycle accident lawyer, helping individuals who have been seriously injured in motorcycle and automobile accidents in the states of North Carolina and South Carolina. Nice post, especially about riding defensively. I have the same argument with bikers all the time, I say that if a biker hits a car that is turning across his path, the biker is a fault no matter what, simply because the biker should be ready for these events at all times and be able to anticipate mistakes of drivers and avoid these kinds of collisions! After all, close called like this happen every day when you are a biker, if you don't read the situation, and end up dying in a crash, does it really matter who's fault it was when you are dead and all the driver has is a dented fender to fix? I agree. I've been riding myself for about four years now and I can honestly say all you need is some serous common sense. I'm always on the defense while riding. I actually right reviews myself at www.powersportsdirectoryreviews.com about motorcycles, parts, and accessories. I have a strong belief that motorcycle parts and accessories can be the difference between being injured or death. It's a great thing to know your stuff about riding.